With all new iOS updates, there’s always the issue of how the new update will impact your battery. I know there have been a few updates that have had negative effects on the batter but for me, iOS7 so far has been pretty good. That’s not to say that others won’t have an issue with it. With that said, here are some helpful tips to help you conserve your battery. These are things that have worked for me in the past, though your mileage may vary. 1. Turn off Wi-Fi and Bluetooth when not in use. Thanks to the Command Center, this makes the task so much easier with just a simple flick upwards from the bottom of the screen and then tapping the Wi-Fi and Bluetooth icons. 2. Turn off Airdrop. Airdrop is a new and easy way to transfer and share files between other iOS users. This allows you to share a photo for instance directly with another user without sending it as a tedious text message or email. However if you aren’t using this function, turn it off to conserve power. 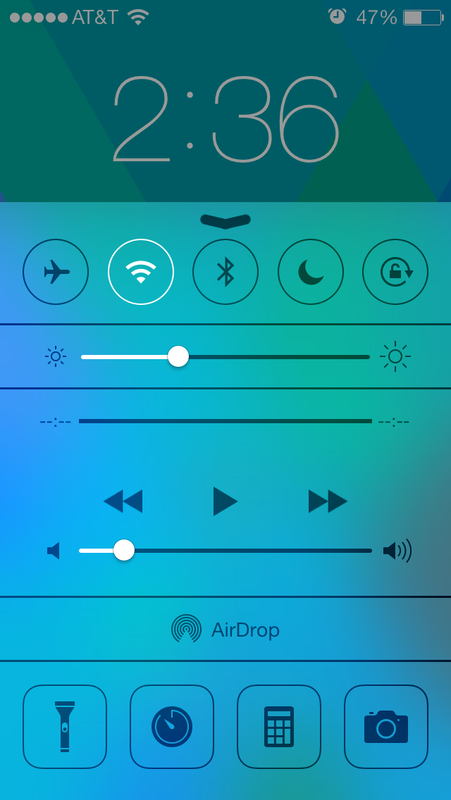 This too can be turned off via the Command Center. 3. Turn down your screen brightness and/or enable automatic brightness. 4. Don’t use dynamic wallpapers. Dynamic wallpapers are fun, but that can also put a strain on your battery. Don’t ask me why, but they do. 5. Check your location services. This is located under the Privacy tab. Either disable it completely or pick and choose which apps you want to use it. Not all your apps need access to GPS at all times or GPS at all. 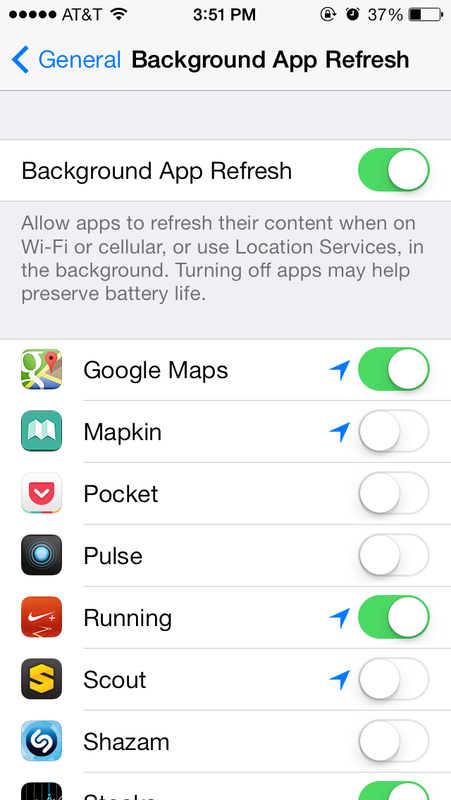 Accessing the GPS everytime the app opens can drain your battery. 6. Under Location Services, scroll down and enter the System Services section of that page. There are a bunch of things here you can turn off that are not necessary. 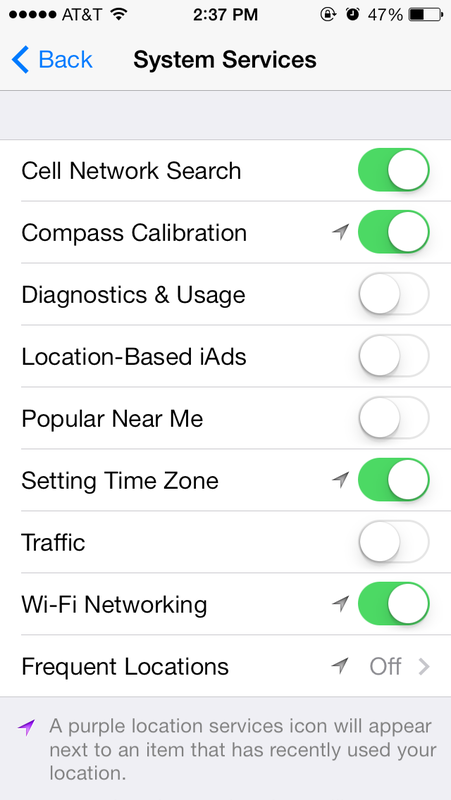 I myself have Diagnostics & Usage, Location-Based iAds, Popular Near Me, Traffic, and Frequent Locations all turned off. 7. Turn off Cellular Data for apps that you do not need to have sending data over cellular networks. Using data over cellular uses more battery than using data over Wi-Fi. 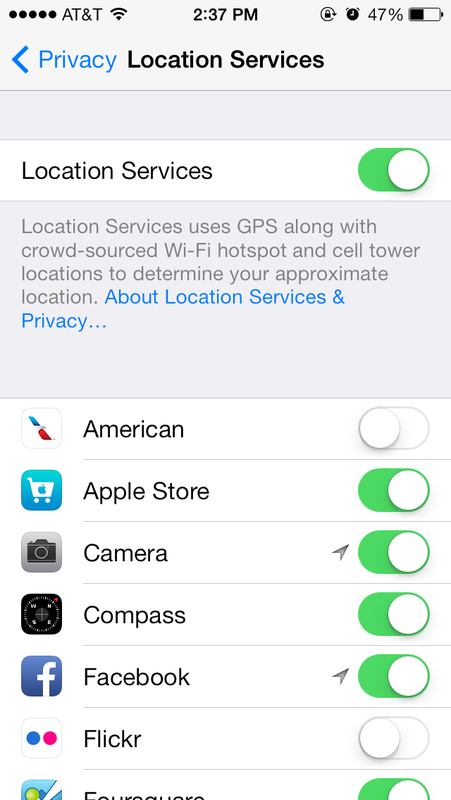 If and when possible, only use Wi-Fi to access data from third party apps to conserve power. I mainly do this got games that have no reason to transmit data over cellular anyways. 8. Disable Background App Refresh or portions of it. This can be found under General > Settings. 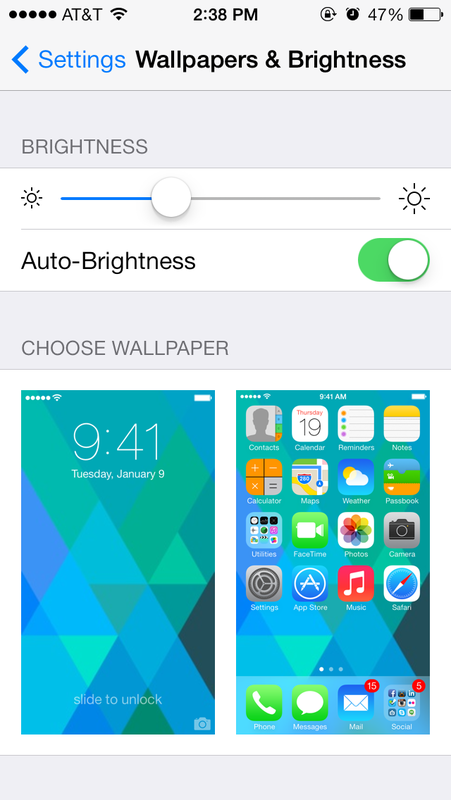 This is a new feature in iOS7 and allows apps to grab content in the background, even when not in use. That means certain apps will always be accessing data and causing slight battery drain. I suggest either turning it off or turning it off for certain apps. 9. Close and apps running in the background that you do not need running. Use the multitask feature to close them. 10. Check your apps. Sometimes, there is an app that will drain your battery even when not in use. I know sometimes it’s hard to tell which one it might be, but for me I usually try to retrace my steps and start deleting recently downloaded apps just to see if this is what it might be. You mileage may vary on this. Again, these are the settings I’ve been using and so far, so good.